Restoration ecology, ecological monitoring, conservation property management. Caitlin completed a bachelor degree of Agricultural Science in 2004 at the University of Melbourne. After university, Caitlin worked for the Department of Primary Industries Victoria for six years in various roles including Pest Management Officer in Bairnsdale, Victoria, Tenements Officer and Community Engagement Project Officer at Spring Street, Melbourne. In 2012, a survey company called ThinkSpatial provided Caitlin the opportunity to become qualified as a flight controller of an unmanned aerial vehicle (Sensefly eBee) for aerial survey and aerial photography purposes. The training to become qualified included undertaking a private pilot's course (theory only) and an aircraft radio Certificate of Proficiency course. The key aerial photography project she has been involved in is the Esperance Port Access Corridor project. 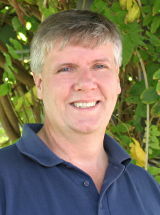 Simon completed Diploma of Horticulture in 2000 and Bachelor of Environmental Science 2005. He worked at University of Melbourne as a research assistant in forestry and tree health and has undertaken projects at Department of Agriculture Western Australia looking at acid sulfate soils on the south coast of Western Australia and alternative lime products to change pH. He moved across to the University of Western Australia, based in Albany, developing a computer model to follow phosphorus movement through dairy farms to determine the effect of best management practices (for reducing phosphorus loss from the farm) at a catchment level. Simon is currently enrolled in a PhD through CENRM, UWA, Albany, looking at factors regulating phosphorus in drains and streams in sandy agricultural catchments in southwestern Australia, using locations in the Wilson Inlet and Oyster Harbour catchments as his study sites. Land use planning and policy; soil science. Enthusiastic about disseminating soil and landscape information. Well experienced in linking soil type to land use, having been involved in multiple small and large scale soil-landscape assessment projects, including international soil survey projects, national soil assessment and soil health programs and several vineyard and horticulture development consultancies in the Great Southern Region of Western Australia. Experienced in soil health community extension, farm planning, soil and landscape assessment, soil organic carbon measurement, monitoring and verification; agricultural and local government land use planning - strategic and statutory. Established in 1987, the WNNPA has more than 65 members who have a range of interests and skills. The association coordinates and is active in a variety of nature based projects in the Walpole Wilderness which include peat rehabilitation, bat surveys, invertebrate studies and weeding programs.